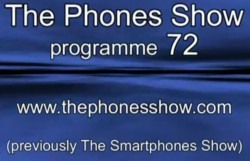 We've been featured on "The Phones Show"
For those of you who don’t already know, Litchfield, who is also Contributing Editor for All About Symbian, is one of the most respected authorities on smartphones and has, in particular, been following developments in the Symbian OS since its early Psion days. In other words, he was there before smartphones became fashionable. On that note, Litchfield also writes regularly about Apple’s iPhone over at All About iPhone. I didn’t know about the ‘other’ Steve and his phones show. Thanks for bringing it up – looks very interesting.